Ever since school started, it's been difficult finding time to blog! But I'm thankful for the wonderful teachers in our Sharing is Caring cooperative; they motivate and inspire me! 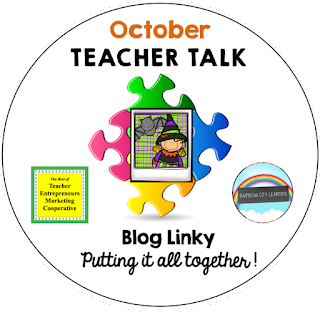 We've changed our name from Sharing is Caring to Teacher Talk; every month we'll host a link party on subjects we teachers want to "talk about". 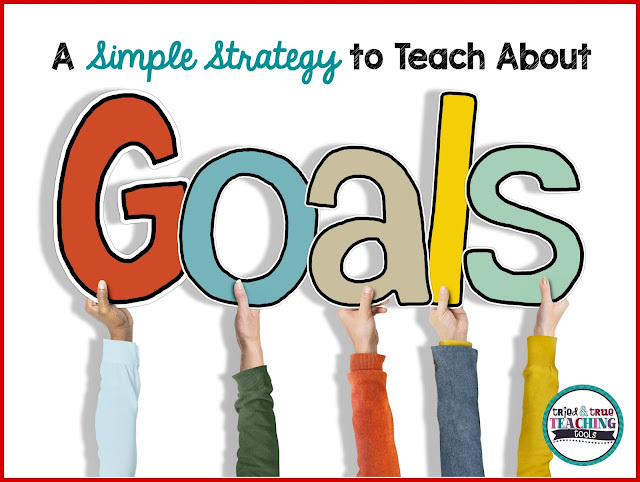 This month I wanted to share a quick strategy to teach goal setting. Goal setting seems like such an abstract idea for kids. After the first few weeks of school, I asked the class what they thought we needed to work on as a whole class. Boy, did they have a lot to say! It was great; they had such buy-in and were taking ownership of our class. We drew a quick bubble map of these needs, then I asked them to prioritize (with justification). As they verbally began to share their thoughts and tried to persuade their classmates, we realized that several of these needs could be group together. After grouping certain needs together, we took a vote and the class noticed that all of these identified areas had to do with them wasting time. So they worded our class goal: Use time wisely. I divided a sheet of butcher paper into 4 columns: what our goal will look like/sound like, evidence (How will we KNOW we met our goal? ), Plan (How will we accomplish this goal? ), and then a daily or weekly evaluation (as a fraction bar). Breaking our goal down into these parts is key to students understanding that a goal is not a wish. We do not wish we could be quiet. We do not wish to have more free time, etc. There needs to be a plan! Click on the button below to hop over to my bloggy buddy, Retta's Teacher Talk, with great tips for October's National Bullying Prevention Month! Great post, Kathie! I love the idea of a class goal and the emphasis on action! Yes, somehow setting a tangible goal as a class makes a somewhat abstract concept become more real! I love this!!! I want to try doing this with my 2nd graders! 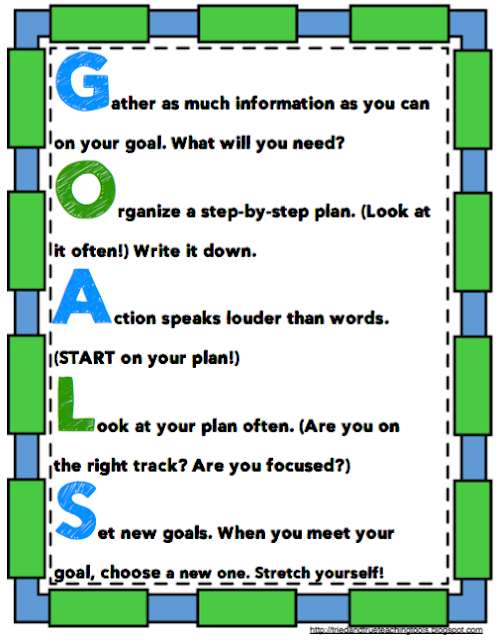 I used to do this goal setting with second graders, too! They can totally understand it! Great post about goal setting. 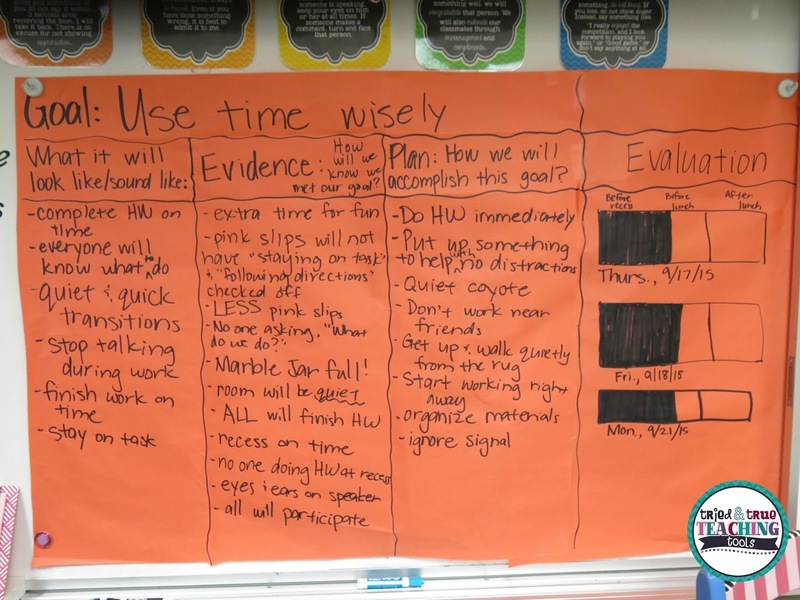 I especially like the idea that students take ownership of their goals. Thanks, Deann! Student ownership makes all the difference in success! This is very timely information for me. I am planning a conference presentation for fellow School Occupational Therapists of my home state of Wisconsin. When I talk to teachers and OTs I encourage them to involve their students in personal goal setting, but we do not all know how to do that. If it is OK with you may use your chart in my presentation? I would give you attribution of course! Thanks for a great post! How terrific that you're encouraging other teachers and OTs! Of course you may use the chart! I must admit, the idea of goals has always terrified me. I think of life more in terms of "projects." This probably explains why, too often, I don't get enough done... *deep sigh of remorse...* (as she plops back down on the couch.) I LOVE this post for kids - and also for me. Thanks so much. I will try harder. You have convinced me that goals are a good thing. What a wonderful topic to cover with kids. I LOVE THIS! I've done this too in classes I've taught, yet, not as in depth as you have. Thank you for the tips and great strategies on goal setting. Kathie, I LOVE this post!!!! 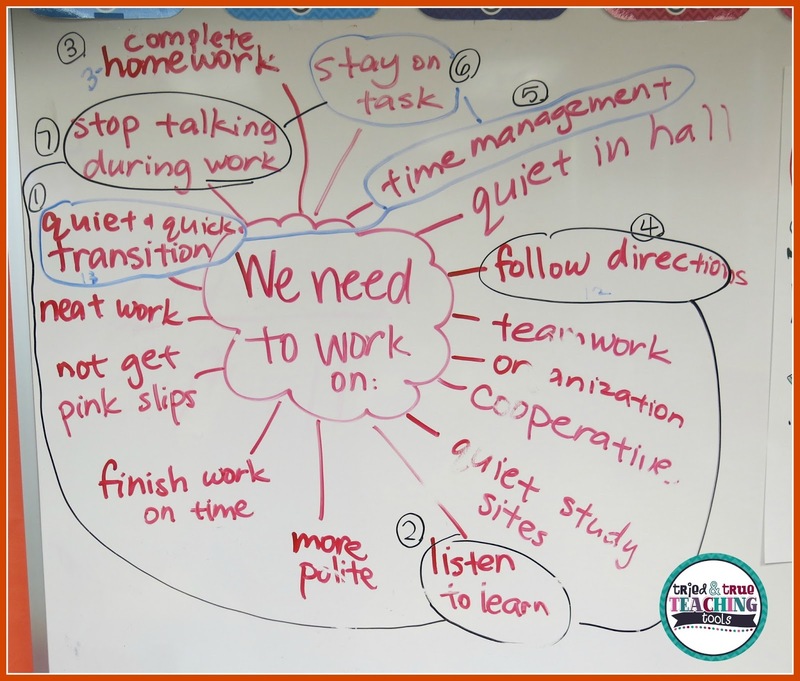 I have had many a brainstorming and goal setting session like this with my students. It's always good to reflect and decide how we can improve ourselves in the context of the learning environment! 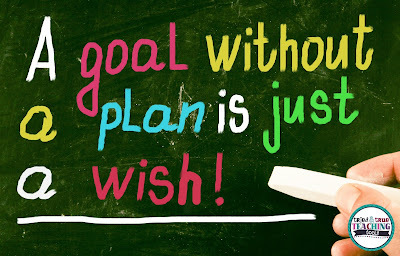 I also love "A goal without a plan is just a wish!" I always tell my students that without having action steps and follow through, a goal is just a wish! You post perfectly complements mine this week about problem-solving classroom issues with student-led reflection during community/morning meeting. Hope you get to check it out! I just went over and read your post; it does connect perfectly!! I love your classroom goals discussion frames!! Thank you for such a great post. I'm thinking about ways to get kids reflecting on their own progress. You've given me a lot of food for thought. Oh good! I hope this simple strategy helps! Love these ideas. So helpful to see how your class responded to the challenge! Thanks, Mary Pat! Yes, my kids definitely understood setting a goal is realistic!